Tim has a keen interest in how technology can change the world we live in. Whether it be amazing new products that were previously unimaginable, or the new dimension digital media can add to marketing campaigns, he is fascinated by the value that can be created by using measurable data to truly understanding the way people interact with a brand or product. Tim is a Marketo Certified Consultant. 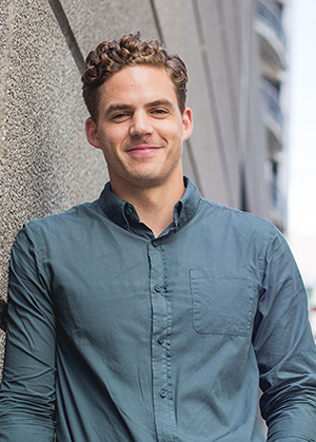 Having delved into the local startup scene and previously worked for one of the Big 4 accounting firms, Tim holds a Commerce and Law conjoint degree from the University of Auckland and has been admitted as a Barrister and Solicitor of the High Court of New Zealand. Tim enjoys taking time out to work on his own startup ideas, practice photography, or travel the globe. Next on his list: Cuba! Tim is fascinated by the value that can be created in truly understanding the way people interact with a brand or product through measurable data. Max is a natural problem solver, using his creative talent to find solutions to challenging projects. Max uses design as a communication platform to bring ideas to life. Over the last 15 years he has cultivated a deep understanding of the various aesthetic requirements in different media forms. Now armed with a keen intuition and an eye for detail, Max heads up the design team as Creative Director, overseeing all work that comes out of the studio, from digital to print and everything in between. Before joining Aamplify, Max was based in Melbourne, leading the in-house creative team for a telecommunications company. Moving home to NZ has been a bit of an adjustment, but he definitely doesn’t miss the snakes (not that he ever saw one). When he’s not at his computer – Mac of course – Max enjoys getting out on the court, field or pitch and playing sport. Top mentions include golf, tennis, soccer and basketball. Max thrives on creating clean, user-friendly design that tells a compelling brand story. Matt has always been naturally design-inclined and his skills are entirely self-taught. He learned Photoshop at the age of 12 and taught himself programming and developing in his teens. This drive to grow his expertise has become addictive and Matt now counts print design, video editing, photography and film among his many skills. From building websites at 14, Matt has gone on to do freelance web development, as well as honing his skills in graphic design at his father’s architecture firm. The aspect he enjoys most about his job is getting to work on new projects all the time, thinking up new ideas and applying lessons from previous work to new scenarios. Matt’s hobbies include watching cricket, cooking and music. In fact, he used to be a DJ on George FM until a former Prime Minister's son took over. Coming from a background in technology, Matt is a digital designer who brings his expansive knowledge and flair (as well as a passion for cooking) to the table. With 10 years of experience in accounting, principally in the educational and health sectors, Lyn looks after Aamplify’s transactional and management accounting. Lyn is also a Certified Public Accountant with CPA Australia. Lyn has a special interest in cutting-edge technologies, particularly in how technology and automation will shape and change people’s lives over the next 20 years—and how we will embrace and adapt as a result. She is currently exploring marketing automation tools that will help Aamplify to improve its reporting. Outside of work, Lyn is mother to two beautiful girls. Her life is busy with taking her kids to after-school activities and spending time at the beautiful beaches near their home. Lyn also enjoys cooking and reading, and she is currently trying her hand at blogging. Her dream is to become a life coach and inspire people to enjoy life, be grateful and to live their lives to the fullest. Lyn is passionate about process improvement and implementing best practices that add value to the organisations she works with.